The Myth: “Heracles is the son of Zeus and Alcmene, a mortal woman. Jealous Hera drove Heracles mad, causing him to kill his brother’s children. To redeem himself, Heracles offered to serve his cousin, the king. The king set Heracles twelve seemingly impossible tasks to accomplish – tasks that require great strength, courage, humility, and wit to overcome. 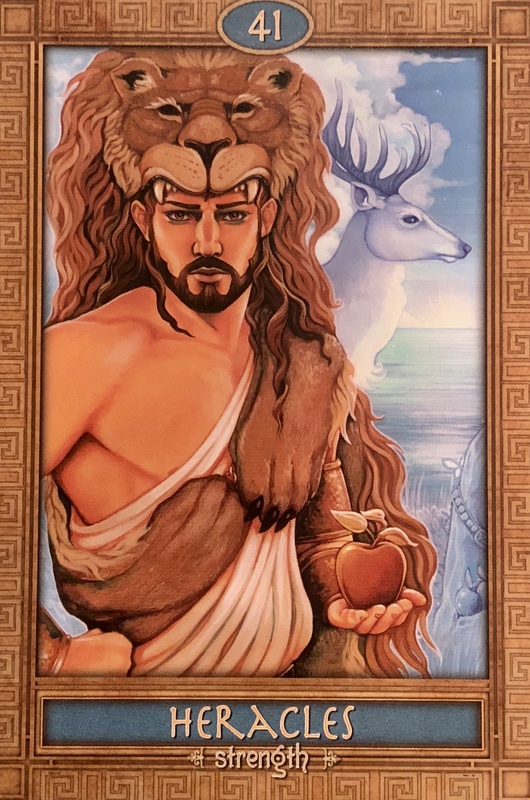 The tasks were supposed to be his undoing, but Heracles proved himself time and time again, accomplishing every task and acquiring magical items or knowledge with each. Upon completing all twelves tasks, Heracles was free to continue his heroic deeds throughout the land. Heracles eventually married Hebe, the daughter of Zeus and Hera. The Message: “This card is about strength, focus, discipline, and wisdom. With these qualities, we can harness our own raw powers and use them to create what we want in our lives. If you find yourself feeling messy, undisciplined, erratic, or caught in any destructive or addictive activity, and your need for instant gratification outweighs everything else, it is time to get organized and take every necessary action to get your life back on track. Yesterday we set our intentions for the new moon, and today we will take the first steps in order to make our dreams come true. Setting goals is the first step but then action must be taken. No one can achieve our goals for us! Dedicating yourself to your plan will take effort, but it will reap great reward. Get out there and do what you have to do, this is not a time for wishing and dreaming, there must be action taken. Use all your mental strength, and even employ your physical strength to the task. You will need all of your courage to stick to your guns and stay the path, letting no one throw you off track. Not everyone will agree with what you are doing, but you do not need them to. You need followthrough. Set the intention, do the work and achieve the goal.